**UPDATE 3/27/19 – Welcome to all the new visitors finding their way here! This tutorial is all over Pinterest, so I don’t want to take it down but I do want to warn you that this tutorial is from 2010 and the measurements are for an iPhone 4. iPhone sizes change too quickly and there are far too many phones these days to keep this updated. Please feel free to use the method to make a sleeve with your own measurements, or you may prefer to sew an Essential Wristlet or Gadget Guard. This sleeve will fit the iPhone 4 with a lightweight case. If you have a thicker case, then you might want to make this a bit wider – 1/4″ is enough to make a difference. If you are a rebel and don’t have a case on your iPhone, then you can increase your seam allowance when you stitch up the sides. This sleeve is supposed to fit very snugly so the phone does not fall out. The tab help you slide the phone in. If you want to make it larger so it does not fit so tightly, you could add some sort of tab closure to the top to keep it from falling out. It looks great! Thanks Erin, I will endeavour to make this tonight or perhaps tomorrow… depending on how well my 2 year old sleeps! Hope the storm wasn’t too big! Thanks Erin for your IPhone sleeve tutorial. I tried several of my own before I finally found one with a flap that worked. I find that I sew much better with patterns to begin with one any project. I am going to try to add a slip for credit cards on here. I’ll let you know if I got it right. Thanks again. I saw this featured on the Craft Gossip site. Thanks for sharing the tutorial, I can’t wait to make one! Looks great Will try it asap! Where did you get your really cute fabric. I want it!!! Please message me with info. Finally, I been looking for pattern to make a case for my ipod touch. Now if could make another version how to add pockets and Strap Wristlet (one with hardware). Thank you. Awesome tutorial! I just learned to sew 2 weeks ago and made this with ease. I made one as you described for my purse and another as a workout arm band! I just attached elastic and velcro to make it adjustable. Works perfectly!!! I think carbiner clip would make it more versatile. Well, at least, that’s how I’m going to do it. Thanks! Great pattern. I can not imagine a much faster project. We did find that for iPhones with a hard case attached, we need to cut the project 1/4″ wider. Easy. 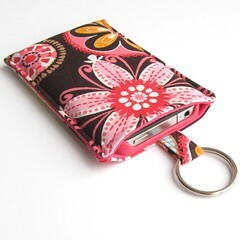 I made this and the circle zip pouch for my son’s iPod Santa is giving him for Christmas!! They turned out AWESOME!! THANK YOU SO MUCH!!!! Hi, and thanks for the great tutorial. Could you please tell me what weight of interfacing you used and did you use a cotton batting? I just made one and I think I used too heavy weight of an interfacing … it probably didn’t help that I also added a small pocket for my credit card that also was interfaced. Thank you again! For fusible interfacing I used Pellon SF-101, a woven fusible, and I used either Warm & White or Warm Blend – I can’t remember and it’s hard to tell from the photo which one it is, but they are the same thickness. You could use a thinner batting, no batting or flannel or something. The credit card pocket is a good idea but if you are doing that I would add some sort of a strap to the top, and if you add a strap you can make the fit a bit looser. Mandy – I haven’t make one for a phone with a large case but you could simply make it a bit too big and then add a clasp or strap to close it to hold it in. That might work? Erin, Would you be willing to sell one of these to me? Carol – I emailed you. Will this work for my driod razr? But I hand stitched the liner fabric on the edges and it worked out fine. It looks great! If you are breaking needles you probably just need a stronger needle. The higher the number, the stronger the needle. Next time, try a denim needle. Some machines just don’t have the power for lots of thick layers but it’s not so many that it should be a problem. I’m glad it worked out! Thanks for sharing! I made it!!! Turned out so cute! My blackberry and droid fit perfectly!!! Thanks for the instructions. This is so cute. I’m going to make it with a matching circle earbud case for my MP3 player and buds. I can use the same split ring and they will always be together. Thanks for the tutorial! Do you remember the name of this fabric? It’s adorable !! Can someone make this for me- I can’t sew, but will pay!!! I am unable to download the pdf. Is there any way you can send the same in a word doc? I did some case and it is as simple as it gets, thanks for the inspiration. I just found this site! Loved your iphone sleeved! Can’t wait to try one for myself! Great tutorial….I just made one a bit larger for a big smartphone and it took me 15 minutes! Super easy instructions and cute case. Wonderful idea I am going to give it a try..thanks so much..
Nice ideas, I will try some of them for sure. Thank you for the tutorial, I have now made everyone I know an iphone cover. Brings back fond memories of the toaster cover I made in the 60’s. Yes they were a fire hazard, but back then EVERYTHING was covered in Laura Ashley prints. Thanks so much! I know I was way late to know this tutorial but it inspires me to try it out. Thank you! I may give it a try. Looks like a cute and easy to make gift. Thank you. My father was looking for a “pocket” to hang around his neck, as he could not get to his phone, in his shirt pocket under his vest, fast enough to answer the phone. Now I d o not have to design it. I will attach a lanyard to it and is will be set to go. Your basic design and instructions were just what I needed to make my husband a sleeve for his phone. I used a foam stabilizer, instead of batting & interfacing, which worked great. I made the pouch part about 1/2 inch shallower than his phone and added a flap closure for protection. This allows him to open it and be able to grasp the phone easily to remove it (large fingers, older hands issue). The flap added a bit more work getting dimensions correct, plus sewing on velcro. I plan to make one with a ring tab like your original design for myself. Love the lanyard idea. I like this a lot! It’s really great to make your own stuff. If you can make this, you can make so much more. Like tabletcases, laptop case the possibilities are limitless. How would you modify this pattern for an iphone 6? Shopping for a new or used vehicle can be quite a hard procedure if you do not know what you really are carrying out. By teaching yourself about auto purchasing prior to visit the car dealership, you possibly can make issues easier for your self. The following tips may help your next shopping getaway become more pleasant. Usually deliver a auto mechanic along when shopping for a brand new vehicle. Vehicle sellers are popular for selling lemons and you may not desire to be their up coming victim. When you can not obtain a technician to check out cars with you, at least make sure that you have him take a look at closing decision before buying it. Know your boundaries. Prior to starting buying for your next auto or van, make a decision what you can manage to pay, and adhere to it. Don’t neglect to include curiosity about your estimations. You will probably pay out about twenty percent as an advance payment at the same time, so prepare yourself. Prior to seeing a car dealership, know what kind of automobile you desire. Investigation most of you alternatives ahead of buying so that you can decide what works well with your finances and family members demands. Shop around to learn just how much you should be paying to get a potential car. Before you sign any agreement make time to study each line, for example the fine print. If you have anything outlined you do not recognize, usually do not sign before you have an solution which you comprehend. Unsavory salesmen can use a legal contract to place numerous charges which were not talked about. When you maintain the preceding suggestions in mind the next time that you just go looking for a vehicle, you will certainly be more likely to get a better bargain. Purchasing a vehicle does not have as a headaches. Just use the guidelines out of this post and you may have the vehicle you desire at the great price. How do you adjust the pattern for an iPhone 7? None of the links to patterns or templates in these tutorials are working anymore. Am I doing something wrong? Is anyone else having issues?